Blackmagic Design has released MultiView 1.1, a major update for its Blackmagic MultiView 16 that features new audio meters, enhanced on-screen labels, and RGB output over HDMI. The Blackmagic MultiView 1.1 update adds new, professional audio meters to MultiView 16 that customers can view audio meters independently for each video input. The meters are superimposed over the video in all layouts, including 2x2, 3x3, 4x4, and solo view, plus VU ballistics that accurately conform to the VU meter standard so broadcasters can rely on the on-screen meters and use them as an accurate tool. Because MultiView 16 can output Ultra HD, the meter graphics are sharp and clear, and on-screen view labels have been enhanced and resize proportionally based on the selected layout so they match the view size. Both audio meters and labels can now be turned on and off independently using the on-screen menus. MultiView 1.1 update adds SD anamorphic support, which lets customers view 16x9 anamorphic SD video sources in widescreen. This update also adds support for RGB output over HDMI for greater compatibility with Ultra HD displays or televisions, and improves the clarity of output when MultiView 16 is used with regular HD displays. 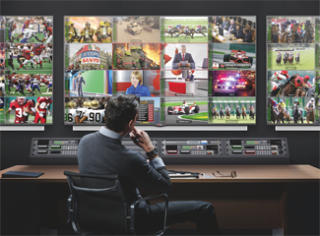 Blackmagic MultiView 16 operates natively in Ultra HD so customers can monitor up to 16 different SDI sources on one single display. Each input also includes a full-frame re-synchronizer, so any combination of SD, HD, and Ultra HD can be displayed at the same time. MultiView 16 can be controlled from its front panel, remotely via software on a Mac or Windows computer, or with an external hardware control connected via Ethernet. "MultiView 16 gives customers 4x more clarity and detail than regular HD multi view monitors," said Grant Petty, CEO at Blackmagic Design. "This free software update adds exciting new features, such as audio meters and improved label design, that make it ideal for even more customers. Now broadcasters can use it in master control rooms and production crews can now take it on the road as a source monitor for live, switched events. This update is free, so existing customers get all of these great new features, too."